Periods of pressure and stress, short or long, are part of everybody's life, whether caused by disturbing events (death in family), usual challenges (new responsibilities), or even happy changes (promotion or increments). 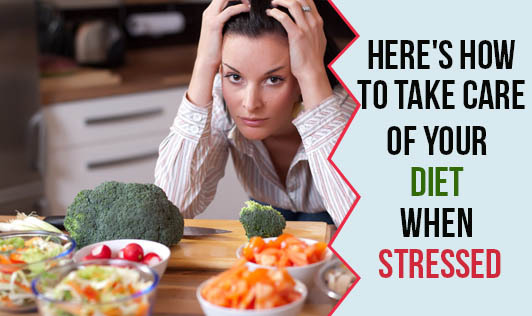 You may not be aware of it but stress affects your body's ability to handle various kinds of foods. One thing that happens when you are under stress is a sudden contraction of your blood vessels. This raises your blood pressure and also reduces the amount of blood going to your stomach and intestines. The flow of enzymes (digestive aids) is slowed down as well. Much of the food you eat, particularly if it has a high fat content, is therefore poorly digested. Instead of being broken down properly, it ferments in the intestine, causing gas and distention. A similar reaction takes place even when one consumes food in a hurried and a restless manner. Another thing that happens during any stress reaction is a hormonal alert that your blood needs more glucose. In simpler terms, you feel hungry. This may prompt you to eat a lot of carbohydrates, either sugar or starch. The reaction is an appropriate one if you are facing strenuous physical exertion, but if the stress is psychological it gives you only unwanted calories, which in turn results in an increase in weight. Cut down on table salt and other high sources of sodium because of their link to high blood pressure. Remember that preservatives and processed foods also contain sodium. Drink only moderate amounts of coffee and tea (maximum 2 to 3 cups/day) and remember that caffeine is present in both. Caffeine, nicotine, and alcohol are stimulants. You should have 8 to 10 big glasses (250 mL each) of fluids in a day. It can be in the form of any liquid, but make sure you drink at least 2 to 3 glasses of plain water daily. This helps to flush waste products out of the body. Potassium is essential for the right balance of electrolytes within body fluids and plays a key role in muscle contraction. Hence consume foods that are rich in potassium, such as sweet lime, bananas, melons, plums, tomato, mushrooms, cabbage, cauliflower, potato, spinach, drumsticks, and tender coconut water. Be sure you are getting enough calcium, as you tend to lose more than usual when you are in a stressful situation. You should try to have at least 2 to 3 glasses of skimmed/toned (reduced fat content) milk or milk products in a day. Vitamin C is important, as it keeps the walls of the capillaries flexible. The blood vessels constrict at the first signs of stress and this results in the depletion of vitamin C in the body. Sources of vitamin C are citrus fruits such as orange, sweet lime, lemon, grapefruit, gooseberry, and fresh vegetables, and sprouted grams eaten raw as salads. Vitamin B-complex serves as a catalyst in the production of energy and in the metabolism of protein and fats. It is also necessary for the working of the central nervous system. Stress, especially physical, increases the intake of vitamin B-complex found in green leafy vegetables, eggs, milk, whole grains, sprouts, and yeast. Nitrogen, the base of body's protein is excreted under stress. So the protein intake should be increased during stress periods. Proteins are present in pulses, whole grains, eggs, chicken, fish, nuts, and oil seeds. Five small meals are better and lighter on the digestive system than three large ones. The additional small meals can be consumed in the form of mid-morning, mid-afternoon, or evening snacks. Last and most important, relax before a meal. Sit down at the table for every meal, putting all your worries aside and eat slowly. Eat happy and be happy!